This article applies to version 1 of Data Factory. If you are using the current version of the Data Factory service, see Web table connector in V2. This article outlines how to use the Copy Activity in Azure Data Factory to move data from a table in a Web page to a supported sink data store. This article builds on the data movement activities article that presents a general overview of data movement with copy activity and the list of data stores supported as sources/sinks. Data factory currently supports only moving data from a Web table to other data stores, but not moving data from other data stores to a Web table destination. This Web connector currently supports only extracting table content from an HTML page. To retrieve data from a HTTP/s endpoint, use HTTP connector instead. When you use the wizard, JSON definitions for these Data Factory entities (linked services, datasets, and the pipeline) are automatically created for you. When you use tools/APIs (except .NET API), you define these Data Factory entities by using the JSON format. 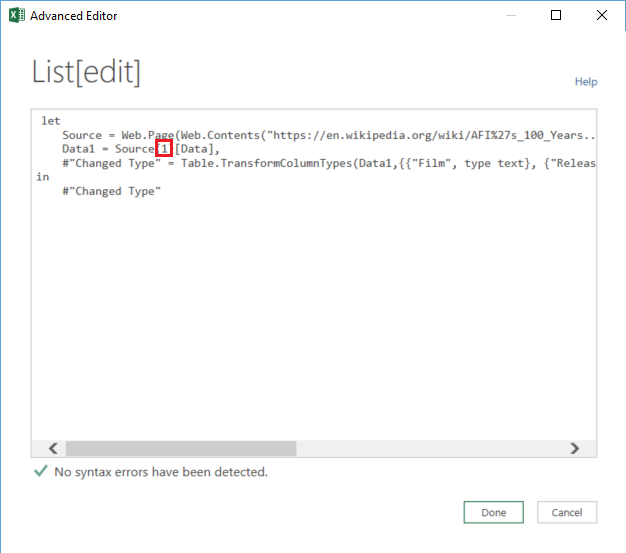 For a sample with JSON definitions for Data Factory entities that are used to copy data from a web table, see JSON example: Copy data from Web table to Azure Blob section of this article. The following table provides description for JSON elements specific to Web linked service. path A relative URL to the resource that contains the table. No. When path is not specified, only the URL specified in the linked service definition is used. For a full list of sections & properties available for defining activities, see the Creating Pipelines article. Properties such as name, description, input and output tables, and policy are available for all types of activities. Currently, when the source in copy activity is of type WebSource, no additional properties are supported. A linked service of type Web. An input dataset of type WebTable. A pipeline with Copy Activity that uses WebSource and BlobSink. The sample copies data from a Web table to an Azure blob every hour. The JSON properties used in these samples are described in sections following the samples. The following sample shows how to copy data from a Web table to an Azure blob. However, data can be copied directly to any of the sinks stated in the Data Movement Activities article by using the Copy Activity in Azure Data Factory. Web linked service This example uses the Web linked service with anonymous authentication. See Web linked service section for different types of authentication you can use. WebTable input dataset Setting external to true informs the Data Factory service that the dataset is external to the data factory and is not produced by an activity in the data factory. See Get index of a table in an HTML page section for steps to getting index of a table in an HTML page. Data is written to a new blob every hour (frequency: hour, interval: 1). The pipeline contains a Copy Activity that is configured to use the input and output datasets and is scheduled to run every hour. In the pipeline JSON definition, the source type is set to WebSource and sink type is set to BlobSink. See WebSource type properties for the list of properties supported by the WebSource. 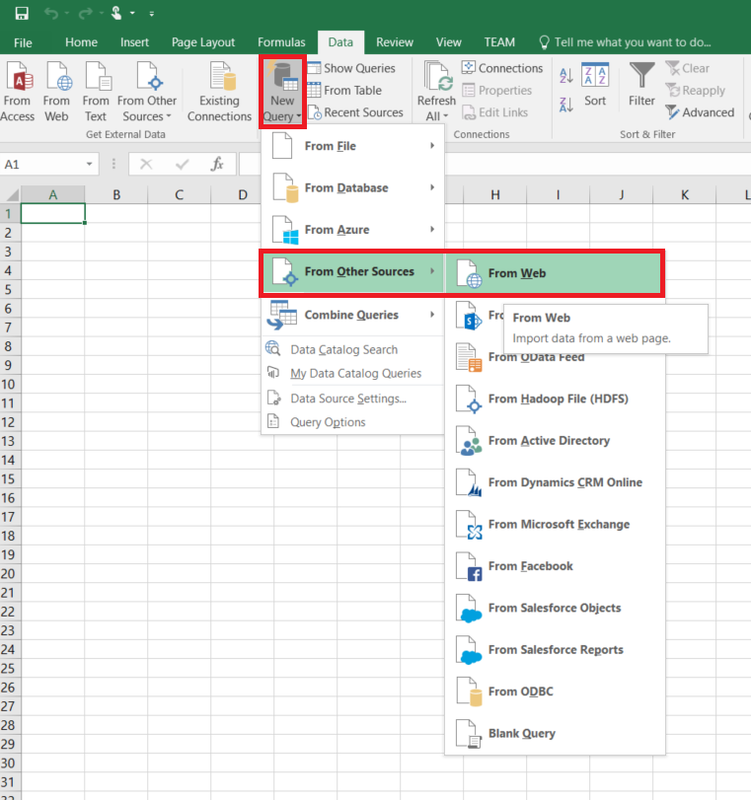 Launch Excel 2016 and switch to the Data tab. Click New Query on the toolbar, point to From Other Sources and click From Web. In the From Web dialog box, enter URL that you would use in linked service JSON (for example: https://en.wikipedia.org/wiki/) along with path you would specify for the dataset (for example: AFI%27s_100_Years...100_Movies), and click OK. If you see Access Web content dialog box, select the right URL, authentication, and click Connect. Click a table item in the tree view to see content from the table and then click Edit button at the bottom. In the Query Editor window, click Advanced Editor button on the toolbar. In the Advanced Editor dialog box, the number next to "Source" is the index. 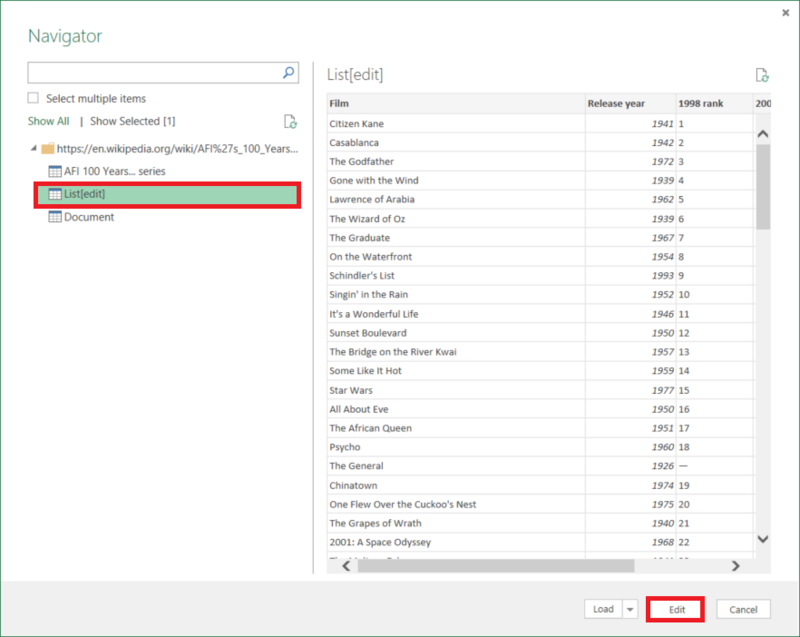 If you are using Excel 2013, use Microsoft Power Query for Excel to get the index. See Connect to a web page article for details. The steps are similar if you are using Microsoft Power BI for Desktop. To map columns from source dataset to columns from sink dataset, see Mapping dataset columns in Azure Data Factory.